For the football player, see Pat Donovan. 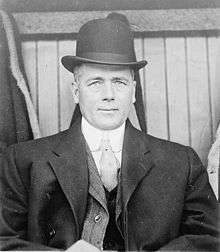 Patrick Joseph "Patsy" Donovan (March 16, 1865 – December 25, 1953) was an Irish-American right fielder and manager in Major League Baseball who played for several teams from 1890 to 1907, most notably the Pittsburg Pirates and St. Louis Cardinals. He batted .300 lifetime and set a major league record for career games in right field, as well as retiring among the career leaders in total games (5th, 1813), assists (9th, 264) and double plays (5th, 69) as an outfielder. Donovan batted and threw left-handed. Born in Queenstown, County Cork, Donovan established himself as the most successful Irish-born major leaguer. He broke into organized baseball in 1886 with the Lawrence, Massachusetts team in the New England League. In 1888 and 1889, Donovan played outfield for the London Tecumsehs of the International Association at Tecumseh Park (today's Labatt Park) in London, Ontario, Canada, where, in his first season in 1888, he led the league in batting with a .359 batting average (according to the Donovan family Web site; however, the London Tecumsehs' official scorer C. J. Moorehead, in a 1903 copy of The London Advertiser, cited Donovan's 1888 batting average as .398), had 201 hits, scored 103 runs and stole 80 bases. His second season with the Tecumsehs was less successful due to a leg injury. In 1890 he made his major league debut in the National League (NL) with the Boston Beaneaters, and moved to the Brooklyn Bridegrooms in midseason; it would be the only time in his career that he played for a league champion. In 1891 he played in the American Association (AA) for the Louisville Colonels and Washington Statesmen; he then returned to the NL in 1892, first with the Senators (the former Statesmen, who had joined the NL in a league merger) before going to the Pirates for most of the year. Donovan starred with the Pirates from 1893 through 1899, notching six consecutive seasons batting .300 and serving as player-manager in 1897 and 1899. The team was sold late in 1899, during a time when the league was contracting from twelve teams to eight; new owner Barney Dreyfuss brought in Fred Clarke to be manager, with Donovan being sent to the Cardinals. He played for St. Louis from 1900–1903, sharing the league lead in stolen bases (45) in his first season, also managing the team in his last three seasons with them. By the end of the 1903 season he ranked among the NL's top ten career leaders in hits and at bats, though he would drop from among the leaders before his playing career ended. His 64 career double plays in the NL ranked one behind Jimmy Ryan's league record. He then served as player-manager for the American League's Washington Senators in 1904, his last season as a regular. In 1903, he broke Sam Thompson's major league record of 1401 games in right field; Willie Keeler passed him in 1906, before Donovan played his last several games and retired with a total of 1620. In 1906, he became manager of the Brooklyn Superbas, and made his last few playing appearances that year, along with one more game at the end of the 1907 season. In a 17-season playing career, Donovan had 2246 hits, 1318 runs, 16 home runs and 736 runs batted in in 1821 games, along with 207 doubles and 75 triples. Donovan collected 302 stolen bases from 1890 to 1897, and 216 more after the statistic was revised to its modern definition in 1898. Donovan joined the Boston Red Sox as a scout in 1909, and managed the team in 1910 and 1911. As a major league manager, he compiled a 684-879 record (.438) in 11 seasons. He was also instrumental in bringing Babe Ruth to the Sox in 1914 through his acquaintance with one of the Xaverian Brothers who coached Ruth at a Baltimore orphans' home. Later he went to the International League, where he led Buffalo to pennants in 1915 and 1916, and also managed Jersey City in 1921–22 and 1925–26. He finished out his career coaching High School baseball at Phillips Academy in Andover, where he coached the future 41st President, George H.W. Bush. Donovan died at the age of 88 in Lawrence, Massachusetts on Christmas Day 1953, and is interred at St. Mary Cemetery in Lawrence. In the Irish Baseball League, the annual award for best batter is named "The Patsy Donovan Batting Champion Award".